This agreement applies as between you, the User of this Website and Julia Noyel, the owner(s) of this Website. Your agreement to comply with and be bound by Clauses 1, 2, 4 – 11 and 15 – 25 of these Terms and Conditions is deemed to occur upon your first use of the Website. Clauses 3 and 12 – 14 apply only to the sale of Services. If you do not agree to be bound by these Terms and Conditions, you should stop using the Website immediately. "We/Us/Our": means Julia Noyel, a company incorporated with the Registrar of Companies with Company registration Number 53476831200033, 33 rue de la république, 69002 Lyon, France. 4.1 Subject to the exceptions in Clause 5 of these Terms and Conditions, all Content included on the Website, unless uploaded by Users, including, but not limited to, text, graphics, logos, icons, images, sound clips, video clips, data compilations, page layout, underlying code and software is the property of Julia Noyel, Our affiliates or other relevant third parties. By continuing to use the Website you acknowledge that such material is protected by applicable International intellectual property and other laws. This Website may contain links to other sites. Unless expressly stated, these sites are not under the control of Julia Noyel or that of Our affiliates. We assume no responsibility for the content of such websites and disclaim liability for any and all forms of loss or damage arising out of the use of them. The inclusion of a link to another site on this Website does not imply any endorsement of the sites themselves or of those in control of them. 9.2 You acknowledge that Julia Noyel reserves the right to monitor any and all communications made to Us or using Our System. 9.3 You acknowledge that Julia Noyel may retain copies of any and all communications made to Us or using Our System. 11.1 Either Julia Noyel or you may terminate your Account. If We terminate your Account, you will be notified by email and an explanation for the termination will be provided. Notwithstanding the foregoing, We reserve the right to terminate without giving reasons. 12.1 Whilst every effort has been made to ensure that all general descriptions of Services available from Julia Noyel correspond to the actual Services that will be provided to you, We are not responsible for any variations from these descriptions as the exact nature of the Services may vary depending on your individual requirements and circumstances. This does not exclude Our liability for mistakes due to negligence on Our part and refers only to variations of the correct Services, not different Services altogether. Please refer to sub-Clause 13.8 for incorrect Services. 12.6 All prices on the Website do not include VAT. In accordance with HM Revenue & Customs VAT Notice 700/1 (February 2014), French Law and supplements thereof, Julia Noyel is not yet liable for VAT and therefore not VAT registered and does not possess a VAT number. 13.1 No part of this Website constitutes a contractual offer capable of acceptance. Your order constitutes a contractual offer that We may, at Our sole discretion, accept. Our acceptance is indicated by Us sending to you an order confirmation email. Only once We have sent you an order confirmation email will there be a binding contract between Julia Noyel and you. 13.6 Julia Noyel shall use all Our reasonable endeavours to provide the Services with reasonable skill and care, commensurate with best trade practice. 13.8 Julia Noyel provides technical support via our online support forum and/or phone. Julia Noyel makes any effort possible to respond to support requests within 24 hours during European business hours (9am to 8pm ECT), but we do not guarantee a particular response time. We want you to be completely satisfied with the Products or Services you order from Julia Noyel. If you need to speak to us about your Order, then please contact customer care on +44 20 81441441, or by email at [email protected] or write to us at our address (see section 1 above). You may cancel an Order that we have accepted or cancel the Contract. If any Specific Terms accompanying the Service contain terms about cancelling the Service, the cancellation policy in the Specific Terms will apply. 14.1 If you are a consumer based within the European Union, you have a statutory right to a “cooling off” period. This period begins once your order is confirmed and the contract between Julia Noyel and you is formed and ends at the end of 14 calendar days after that date. If you change your mind about the Services within this period and wish to cancel your order, please inform Us immediately using the following email: [email protected]. Your right to cancel during the cooling off period is subject to the provisions of sub-Clause 14.2. 19.1 The Website is provided “as is” and on an “as available” basis. Julia Noyel uses industry best practices to provide a high uptime, including a fault-tolerant architecture hosted in cloud servers. We give no warranty that the Website or Facilities will be free of defects and / or faults and we do not provide any kind of refund for outages. We provide no warranties (express or implied) of fitness for a particular purpose, accuracy of information, compatibility and satisfactory quality. 20.4 The information offered in the online products (videos, e-classes etc.) and on www.julianoyel.com, in any newsletters, videos, emails, other products are given in line with Julia Noyel’s function as a Coach and from her personal and initial training, her complementary trainings and her personal experience. She is neither a doctor, nor a psychotherapist nor a psychologist. Julia Noyel does not claim to know what is good for the User. She offers different tools and information, helping the users, her customers and her readers to broaden their frame of reference and increase their level of knowledge and awareness about themselves. Julia Noyel draws the attention to the user and the CLIENT on his / their own responsibility of the use of information and advice and his / their own personal potential to become an actor of his / their life. Users / CUSTOMER and readers are aware (s) that the information contained on this site is not medical advice, nor psychotherapy. The proposed information does not replace any psychotherapy or the follow-up of a doctor. Julia Noyel does not pretend to diagnose, treat, prevent or cure a disease and in any way. The User / CUSTOMER / reader of the advice and information contained in the products needs to consult an appropriate health professional if he or she has any medical problems. Julia Noyel presents several tools and techniques in her products. The CLIENT / the reader is free to use the tools or not. In no case the User / CLIENT / the reader is obliged to use the proposed tools. The User / CUSTOMER / reader recognizes that some techniques (eg so-called energy techniques such as EFT, Reiki, Jin shin Jyutsu and the use of mudras) are still experimental and may possibly have unknown side effects nowadays. The User / CUSTOMER / reader is aware that the possible side effects of alternative methods and energy care can be dangerous. Thus, the User / CLIENT must assume full responsibility when using these techniques. All information is designed to provide helpful information, a review of resources and motivation on the subject discussed; however, this is not an exhaustive treatment of the subjects. Every effort has been made to provide accurate and dependable information. 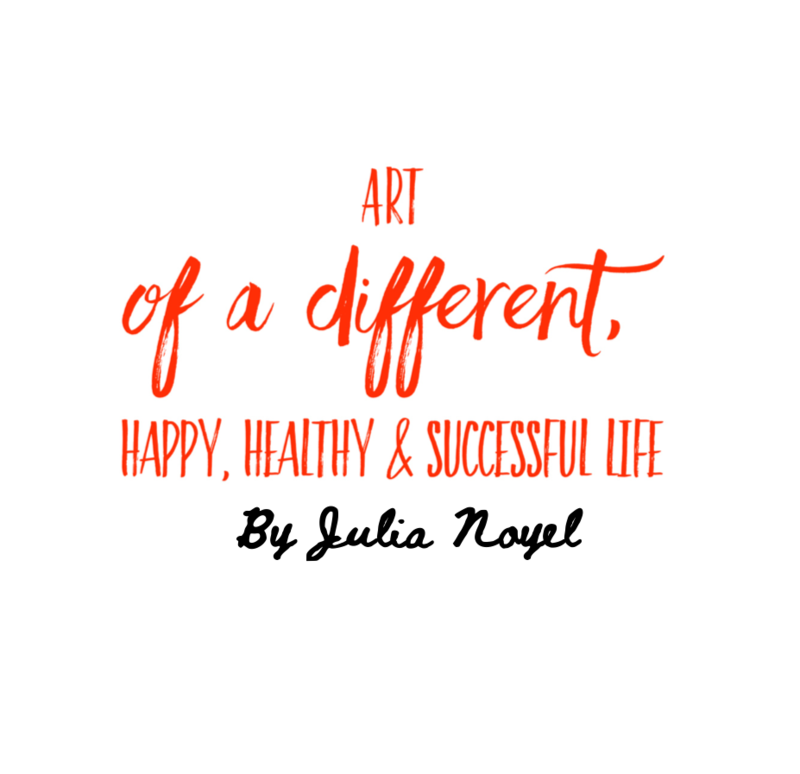 All information in Julia Noyel's training programs and website, E-books, books, audio-classes, training and online consulting is presented for educational, informational and entertainment purposes, not to render any psychological, health, legal, or any other kind of professional advice. The information contained in Julia's training, coachings, ebooks, books should not be treated as a substitute for seeking help from an appropriately trained professional or expert. The aim of information given on www.julianoyel.com and https://artofadifferenthappylife.getlearnworlds.com, in training classes, ebooks, audio-classes, freebies, articles is to help people to re flect on their current behavior, to adopt healthier practices, to reduce harmful behavior, and to help them to create a happier, healthier & more successful life. However, each person, each situation, each context is different and the advice and strategies contained herein may not be suitable for your specific situation or might need to be adapted to your conditions and your specific context. Even if the tools and advice as described here have helped me and many people to lead a happier, healthier & more successful life, this might not be the case for you. Also, you need to be aware that there might be various external factors that will have an impact on your happiness, health and success you can not influence. You should seek the services of a competent professional before beginning any improvement program and at any time when necessary. The content is my sole expression and opinion gained based on my observations, my personal and professional experience, my current education, based on studies undertaken by external parties, the knowledge of other authors as credited in the food notes and mentioned in the further readings. The information contained has been obtained from sources believed to be reliable. However, neither the author nor the publisher guarantees the accuracy or the completeness of any information published herein. Although every precaution has been taken in the preparation of learning programs, ebooks, books, audio classes, freebies, Julia Noyel assumes no responsibility for errors or omissions, professional disagreement, outdated data or adverse outcomes that derive from any information resources provided on www.julianoyel.com or https://artofadifferenthappylife.getlearnworlds.com/. Julia Noyel assumes no liability for losses or damages, or injuries resulting from the use of the information contained in learning programs or application of thes contents, whether directly or indirectly. You are responsible for your own choices, actions, non-actions and results. I cannot give you any guarantees that tools or advice given in my books, ebooks, training programs, video classes will work for you. Professionals in the field might have different opinions, and change is always taking place. The characters used in the examples or cases are either fictional or the names or identifying characteristics were changed to protect the privacy of the individuals. Any likeness to actual persons, either living or dead, is strictly coincidental. affect the validity and enforceability of the remaining Terms and Conditions. This term shall apply only within jurisdictions where a particular term is illegal. These Terms and Conditions and the relationship between you and Julia Noyel shall be governed by and construed in accordance with French law and Julia Noyel and you agree to submit to the exclusive jurisdiction of the French Courts.